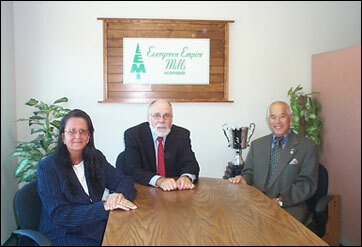 "Supplier of Quality Forest Products Since 1982"
Evergreen Empire Mills was incorporated in Canada in April, 1982. A joint venture between Jack Hetherington, Charlie Loo and The Probyn Group of Companies, log exporters and lumber manufacturers, the new company offered its services to the international lumber industry as a service oriented wholesale supplier of quality forest products. Even in the depths of the early "Eighties" recession, the company flourished, supplying only quality products and exemplary service. In 1986 The Probyn Group sold its shares to Hetherington and Loo and the two of them wholly own the Company to this day. The association with The Probyn Group was venerable and mutually beneficial. Probyn's initial support gave the fledgling company a foundation on which to thrive and grow to become the company it is today. The Company has built on its early beginnings. Its philosophy of absolute honesty and integrity is as true today, as it was then. Coming from a sea-going background, he was first a bridge officer in both the Merchant Navy and the Royal Canadian Navy (R), then a dock supervisor in the Port of Vancouver before entering the lumber industry in 1977. He believes firmly in open communication and total customer service, traits honed early while learning the lumber business at Probyn Lumber. He believes a positive attitude is so important in life. "There are no problems, only projects." Interests away from the Evergreen Empire include sailing, writing, and public speaking. And more sailing. The Company's elder statesman, there is nothing about the lumber business he doesn't know. Trained by the legendary Len and George - Len Mayes and George Cruickshank -- at Pacific Overland Timber, he has been an integral part of the lumber industry since 1971. Bringing with him a commerce degree from the University of British Columbia, he entered the lumber business following a brief banking career way back in the "Sixties." A passionate advocate of "never be late" when it comes to payables, his outside interests include three disciplines: skiing, skiing, and skiing. Oh, yes, and his 1967 Mustang GT fastback. Keeping the daily administrative requirements of the Evergreen Empire properly on track since 1985, she began her career in the lumber industry with Greenwood Forest Products in 1978. Dedicated to professionalism and service, her commitment and loyalty to Company, to customers and to suppliers is exemplary. Attention to detail is almost an obsession. She keeps Evergreen's sales staff steering the proper course at all times: the job isn't finished until the paperwork's done. In addition to her other family -- the one on the home front --interests include the artistic world of crafts, and Winston Cup Auto Racing. © 2003 Evergreen Empire Mills, Inc. All rights reserved.